I almost always start my classes with having everybody slowroll for a few rounds to warm up. I hate doing stretches, running, etc. so I would rather educate people to understand slowrolling, as it is a much more fun and activity specific way to warm up. Throughout the years I have taught, I have tried to teach people how to slowroll and it is not easy. Especially with new guys. You can be 100% sure, that if you just say "now you roll really light and easy", then it will only work for the first 30 seconds before people start to tense and speeding up and the whole idea of the drill is gone out the window. As with most meathead-issues in BJJ, the answer is education. I believe that intelligent athletes that know how to train smart is what we want - not tough guys who can take a punch and go hard for hours. So I have written down a few points that I use, when I explain people in class how to slowroll. Putting emphasis on this has made a big difference and I can have students slowroll intelligently in no time. I also use this in my MMA classes and have everybody "slowspar" MMA with small gloves. Works really well and gives everyone an opportunity to play with eachother, not compete against eachother. The purpose of slowrolling is to warm up, experiment, play, put yourself in bad spots, work on your weak points and have fun. The purpose is not to win, to get a submission, to beat someone better or worse than yourself or to not lose. Try to do everything you can to not win. Don't go fast and don't tense up. One little thing I do if I see some people start to go too fast or use too much strength is, that I yell "freeze!" to make everybody stop. Then I tell people to take the level of speed and intensity that they are at now and divide it by 2. That can sometimes "reset" the class, and make people start over at the right intensity. This point is really crucial to make people successfully slowroll. You MUST let your partner succeed most of the times with what he is trying to do. If he is trying to go slow and you keep defending what he is doing, then - even though you might go at a slow pace yourself - he has to turn up his intensity to be able to do anything else than defending. When he turns up his intensity, you will automatically match his level, and you are on your way to roll competitively instead of slowrolling. Let your partner do what he is trying to do, and he will return the favor. The result is less tension and less chance of turning up the intensity. If you get a submission, let your partner escape and keep going. Don't force it to get a tap, it will only create tension. In fact, I don't think there should be any taps in slowroll at all. If you feel like your partner is starting to go a little too fast or a little too hard, TELL HIM. If you don't communicate it to him, he will most likely not know what you are thinking. Unless he can read your mind. And what will then happen is, that you have to match his level of intensity. Don't do it. Tell him to slow down instead. Enjoy the training, remember that it is only a game. Have fun and relax :) The sideeffect of having fun is most often, that you learn more. I love this way of thinking… It's pretty much the same way we do it, and the results are great! Not only do we have more fun while training, but we get better, faster. With the slowroll and “let's have some fun” way of thinking, people are more free to enjoy themselves and learn from their mistakes. At our gym, this method has even changed the way our students relate to other people. They (we) learn to gradually and continually downsize the ego, which can really get in the way of having a good time. This hit so close to home that I had to toss a quick reply down. My brothers and I have been rolling on our own for about 7 years and slow rolling is a staple of ours. 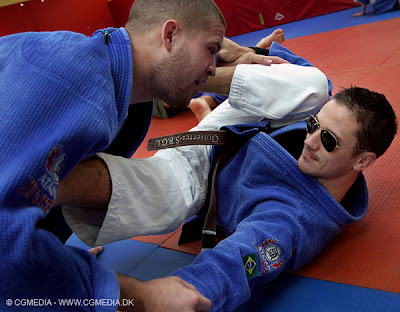 I have recently joined an awesome Gracie Barra school, but they don't do any slow rolling...I sure miss it. When you see good slow rolling being done it can look really beautiful...seriously! Additionally, I am a huge fan of your blog. My brothers and I are on it at least a few times a week. Just wanted to drop a quick thank you for all the hard work. Please, please, please keep it up! Any chance you would be able to post a video clip of some of your slowrolling?